This April 19th-22nd, over 50 singers from Canada, the United States, and Ukraine will be presenting Resurrection: Music from the Ukrainian Sacred Choral Tradition in Toronto, Rochester, Philadelphia, and New York. 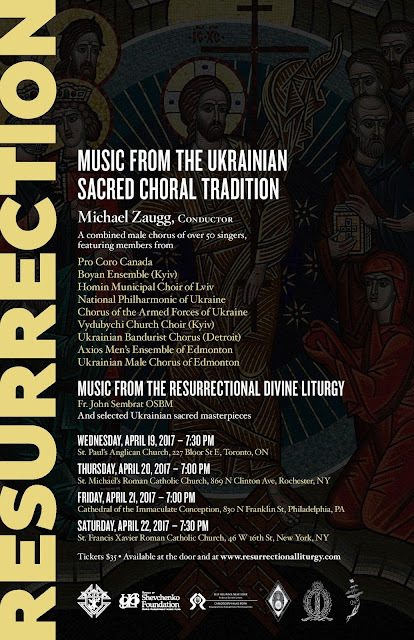 This concert series will showcase the new composition for a setting of a Resurrectional Divine Liturgy by Ukrainian Catholic priest Fr. John Sembrat OSBM, including masterpieces specific to the Paschal services from renowned Ukrainian composers such as Dmytro Bortniansky, Artem Vedel, and Roman Hurko. The choir will be led by one of the leading choral directors in North America, Michael Zaugg of Pro Coro Canada. This combined male choir features fourteen members from the following renowned professional choirs in Ukraine: the Boyan Ensemble of Kyiv, the Chorus of the Armed Forces of Ukraine, the National Philharmonic of Ukraine, the Homin Municipal Choir of Lviv and Vydubychi Church Choir of Kyiv. The 50-plus member ensemble will also include members of Edmonton’s professional ensemble Pro Coro Canada, the Ukrainian Bandurist Chorus of Detroit, the Axios Men’s Ensemble, and the Ukrainian Male Chorus of Edmonton.